Today I’m thrilled to be hosting the lovely Daniel Pembrey, author of Night Market, his latest novel in the excellent Henk van der Pol series. Daniel has done a great post for today’s stop, which you can catch further down. Here’s all of the important bookish information first! To receive occasional email updates and offers of free exclusive content, please sign up at http://www.danielpembrey.com. Daniel is also on Twitter, @DPemb. KM: You just interviewed Michael Connelly for The Telegraph, [Investigate a different side of Los Angeles by Daniel Pembrey] – and Titus Welliver, who plays Bosch *swoons*! Was Bosch a big influence on your own detective fiction? DP: Very much so. 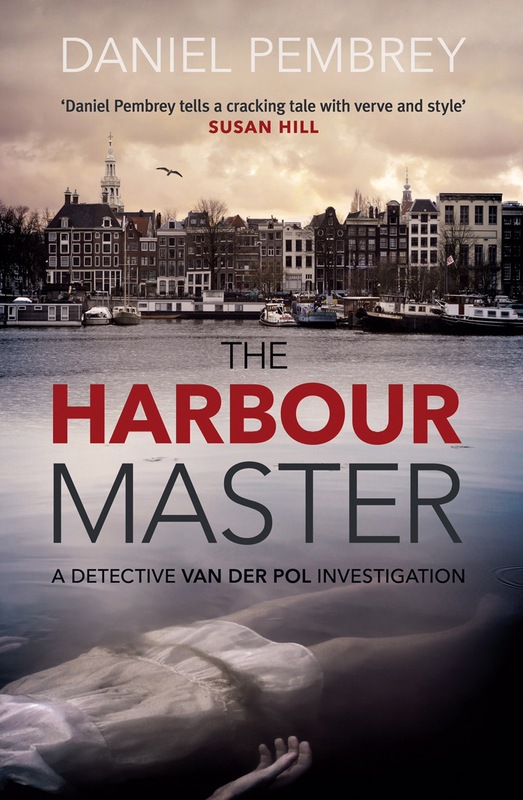 I pretty much conceived my character as a Dutch Harry Bosch – which is sort of ironic, given that Hieronymus Bosch was a Dutch painter – but I couldn’t find that type of police detective story when I began living in Amsterdam, so decided to write what I wanted to read. KM: I have to ask you right away: what is Titus Welliver like? DP: Very down to earth, for a prominent Hollywood actor. I visited the night time set where they were filming an outdoor chase between Bosch and the bad guy in remote, wooded terrain; in the story, it takes place on an island off the coast, but it was in fact shot in LA’s Griffith Park. Titus was calling his wife between takes, saying goodnight to his kids. He’s clearly a big family man … a seriously cool guy. KM: Bosch began 25 years ago, a lot younger, but your character, Henk, starts off close to retirement. Why did you make that choice? DP: Generally I’m more interested in older characters. They have life experience, and mental scars, and tend to be more complex. It’s more engaging when they have to use their cunning and street smarts to take on a villain. It’s the same with Ian Rankin’s Rebus character: a physically imposing guy who was in the SAS, but who is now older, who has to use his contacts and wiles. That’s a more interesting character to write. How do you feel as the reader? KM: Well, I agree … though a physically in-shape man has a certain appeal too! DP: Henk van der Pol can still look after himself, physically. But your point is a good one, so I can reveal for the very first time here (*drum roll*) that I’m working on a new story – a novella, to start with – in which Henk is at the start of his career, in 1983. He’s a young man in a hurry, chasing after the woman, Petra, who is to become his wife, and working on the infamous Freddy Heineken kidnapping that year. The working title is Henk 83. KM: Ooh, I like the sound of that! Has it been done before – writing an earlier version of an established detective character? DP: I also just interviewed Jørn Lier Horst in Norway (coming soon to another newspaper near you! ), and his latest book, When it Grows Dark, takes his William Wisting character back to 1983 too. Mankell did a similar thing with Wallander, in The Pyramid. KM: Fab. So when will ‘Henk 83’ be out? DP: All being well, later this year. Hopefully in time for Christmas. It takes a lot of of research. I’ve tracked down one of the police detectives who ran the Heineken case. I’m also watching ‘80s Dutch films; it was a different city then, much more edgy. There was open drug use in the streets, people lived in squats. Canal-side houses, which now go for millions, are vacant. KM: The location is key for you? DP: It really is. This was something else I learned from Connelly and his use of Los Angeles for Bosch, which I wanted to explore in that Telegraph article. Rankin, Edinburgh and Rebus; Horst, Vestfold County and Wisting. These characters not only inhabit their settings but also grow organically from them. KM: Can location be restricting? DP: Possibly, eventually. Connelly rotates his characters – he has Haller, the defense attorney, and a couple of others. For me, it was important that my character could get out and rove around the Benelux region (and beyond). So his investigations take him to Brussels, Antwerp, London, and even Norway – William Wisting’s beat, as it happens. KM: But he returns Amsterdam. DP: He does. It’s his beat. And it’s a great beat to have.